Monet's Canvas Cathedrals: A Life Study Of Light Seated across the avenue and working on 10 canvases at a time, Claude Monet shuttled swiftly from easel to easel as the sun moved across the sky. 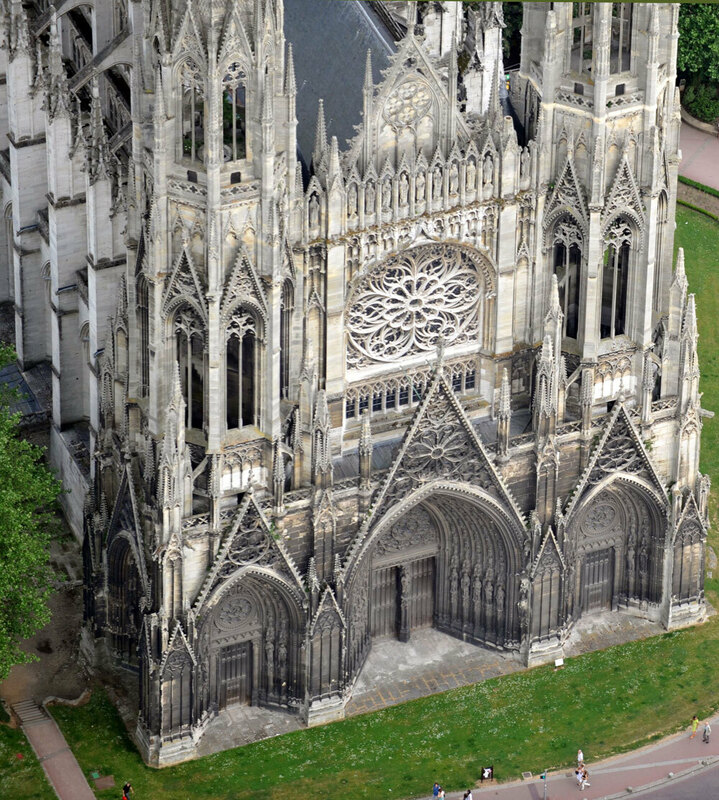 He completed more than 30 paintings of his subject — the Gothic Rouen Cathedral. In the second of a three-part series, NPR's Susan Stamberg reports on the impressionist master's quest to capture the ever-changing light. 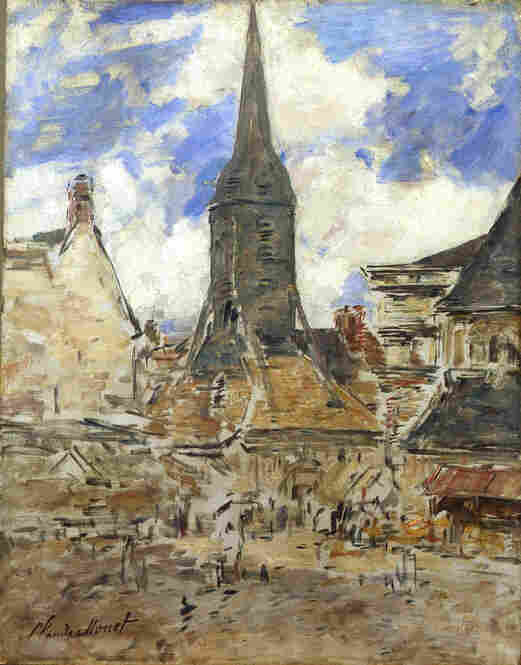 Le clocher Sainte-Catherine by Claude Monet, 1867. 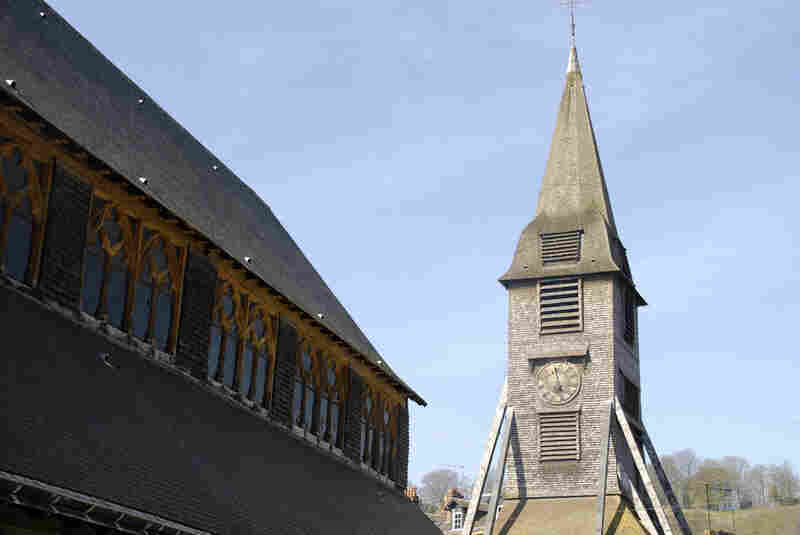 The bell tower of Sainte Catherine, located in the village of Honfleur in Normandy, is not actually connected to the church itself. The builders wanted to prevent the church roof from collapsing under the weight of the bells, and they also wanted to avoid a fire in the church in case the tower was hit by lightning. The bell tower of Sainte Catherine. The church is unusually shaped — it resembles an upside-down ship, probably because Sainte Catherine was constructed by shipbuilders in the 15th century. Personnages sur la plage de Trouville by Eugène Boudin, 1865. Boudin advised the young Monet to paint outdoors, or en plein air, in order to take advantage of natural light. Soon, painting en plein air would become a hallmark of the impressionist movement. 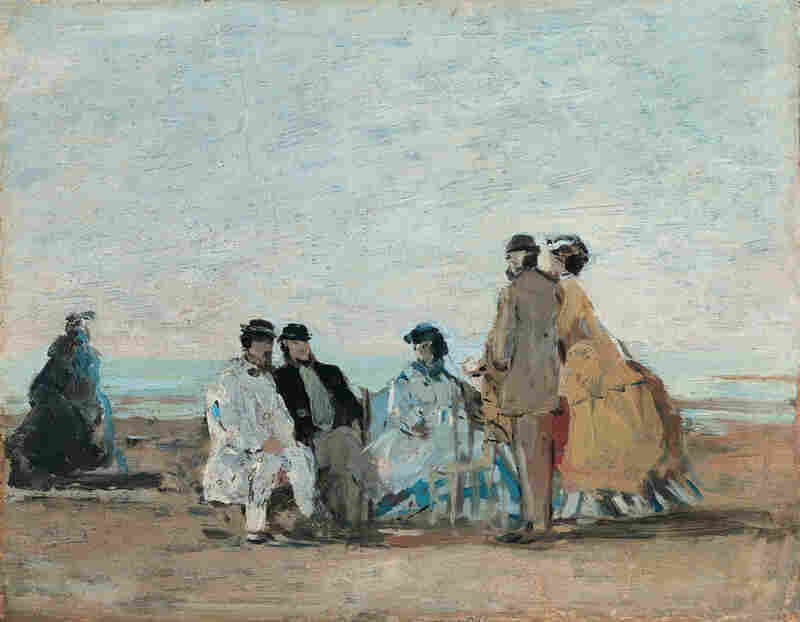 Conversation sur la plage de Trouville by Eugène Boudin, 1876. The incredibly prolific Boudin painted more than 800 pieces over the course of his career, the vast majority of which depicted beach scenes and ships. 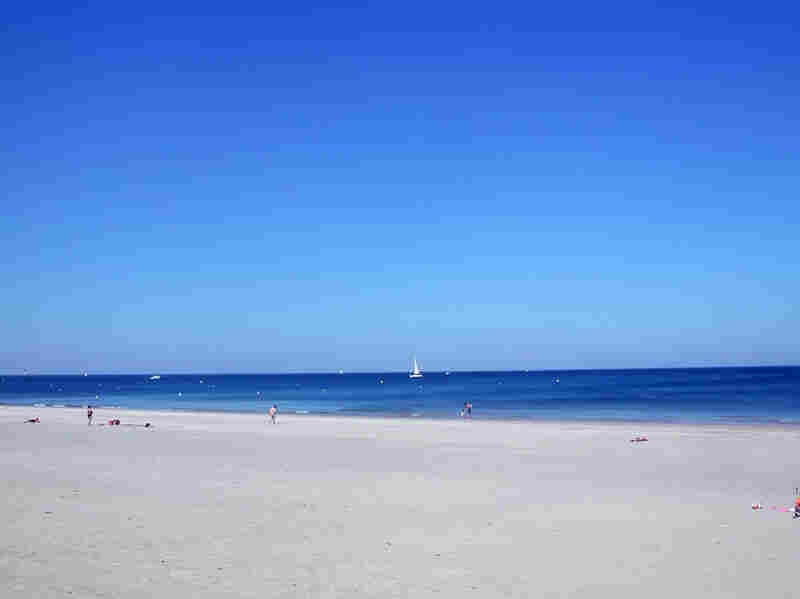 The beach at Trouville. Trouville became a popular tourist destination in the 19th century, when a new craze for "sea-bathing" swept through France. Its boardwalk was built in 1867. 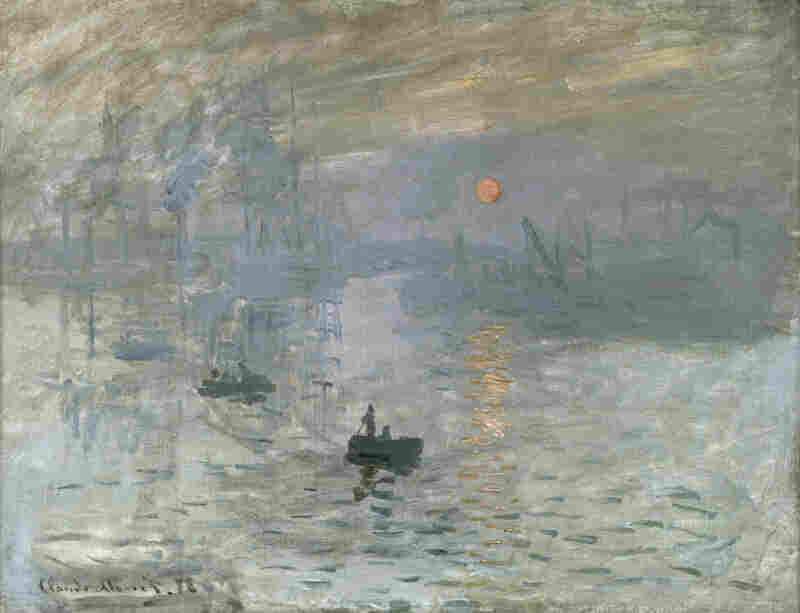 Impressionism: Sunrise, by Claude Monet, 1872. This painting is usually credited as the founding work of the Impressionist movement, with its sketchy brushstrokes and emphasis on lighting effects at the expense of human figures. Le Havre Waterfront. Claude Monet grew up in Le Havre, a seaside town in north-western France. Over the course of the 19th century, Le Havre became a thriving industrial center, with much of its economy focused around its busy port. 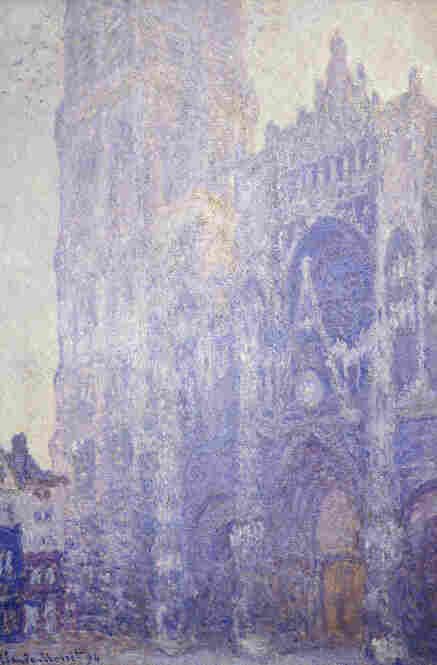 Rouen Cathedral doorway and tower in morning light, harmony in white, by Claude Monet, 1894. 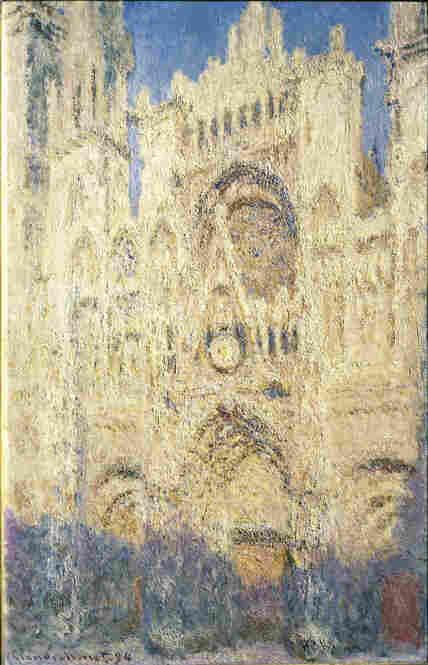 This is one of the 30 paintings of Rouen Cathedral that Monet worked on in the period 1892-1894. The artist focused on capturing the effect of light on the stone masonry at different times of day. Rouen Cathedral in the Afternoon, by Claude Monet, 1894. Monet would usually work on the cathedral paintings from 7 in the morning until 6 or 7 in the evening, painting up to 10 canvases at once. Hotel Des Finances. 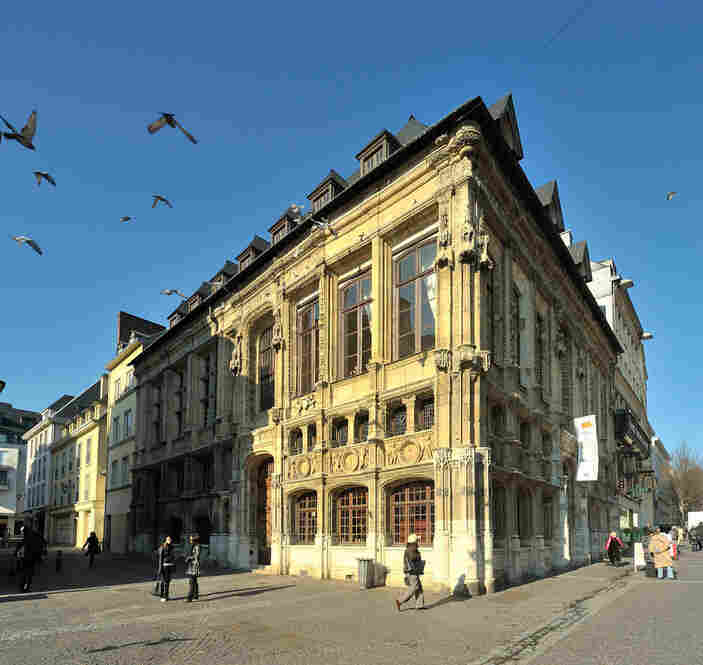 Monet began working on his series of the Rouen Cathedral from the first floor of this 15th-century building. At the time, it was a lingerie shop, and Monet had to work behind an improvised screen so as not to disturb the shop's customers. Water Lilies by Claude Monet, 1906. 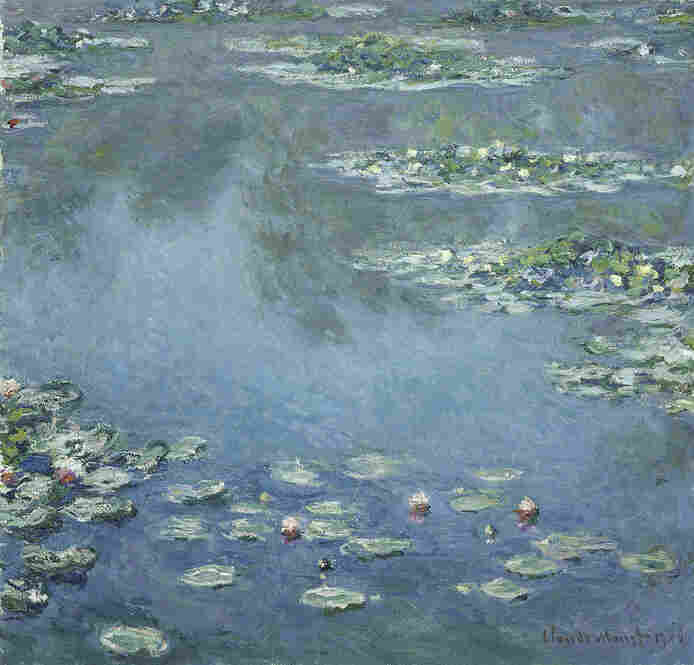 This was one of many in a series of paintings Monet did of the lily ponds surrounding his Giverny home. 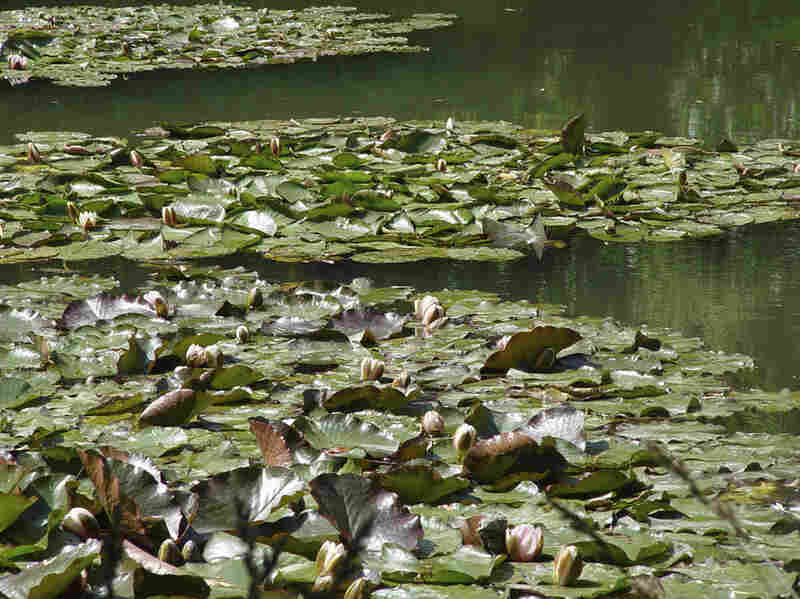 A closer view of the water lilies in the gardens surrounding Monet's home in Giverny. Monet made his garden, now a popular tourist attraction, with the help of his family and six gardeners. Water Lily Pond by Claude Monet, 1900. 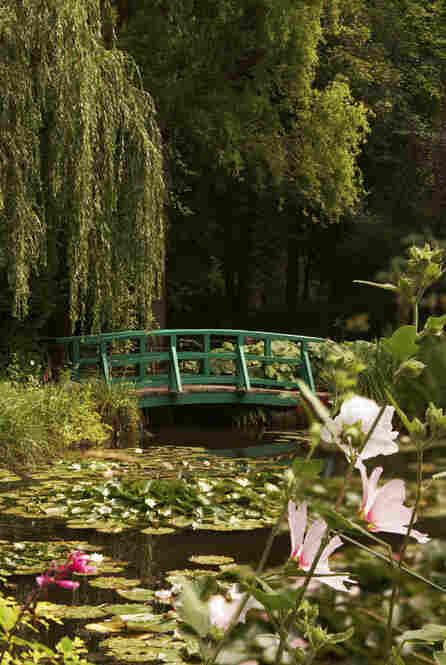 Monet loved the way light moved over the lily pond at Giverny, which is spanned by small green bridges. Another view of of Monet's garden as it is today. 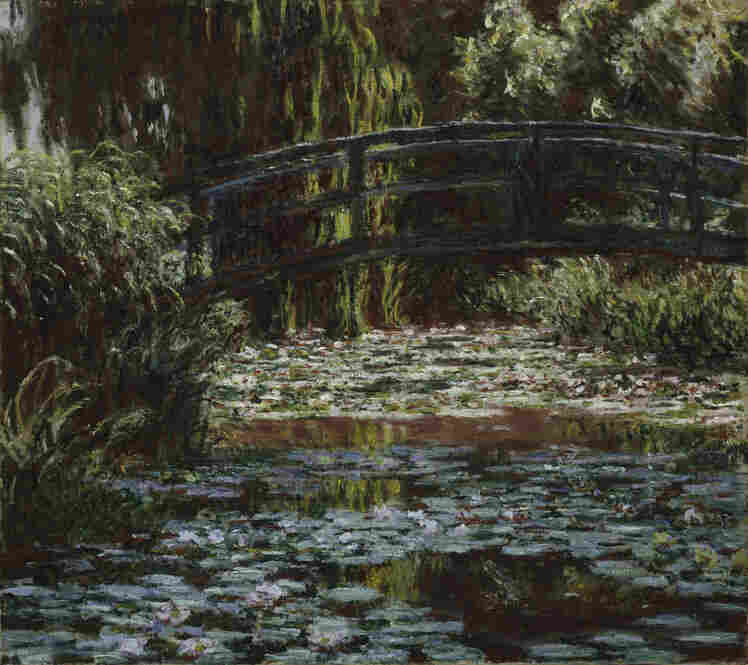 Monet modeled this part of the gardens, surrounding his house, on Japanese gardens. 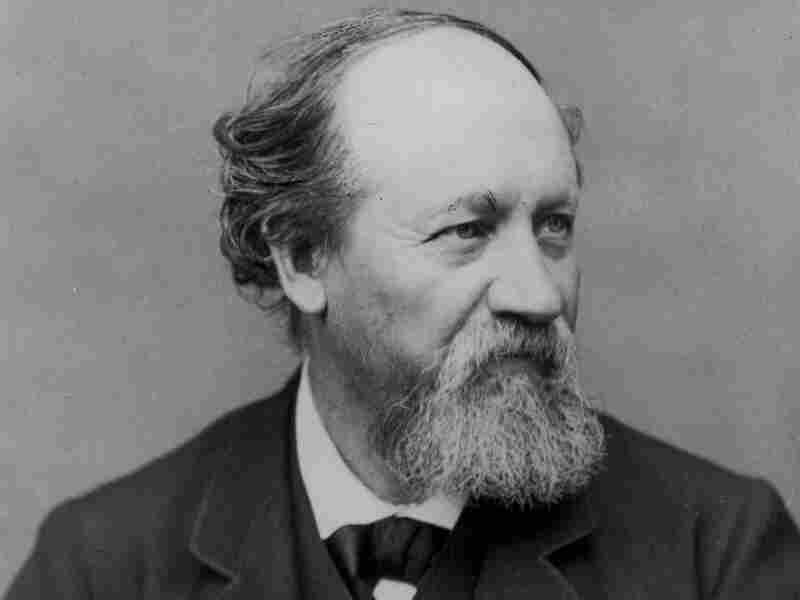 The artist was an avid collector of Japanese prints, which influenced Impressionism as a whole. In 1872, in the French port city of Le Havre, 32-year-old Claude Monet made a painting that would give an art movement its name. Monet called his painting Impression, Sunrise. It was a quick, brushy harbor scene -- small boats and watery reflections in pinks and blues and oranges. When Monet displayed the painting in Paris, along with similar works by artist friends, a sneering critic called the show "The Exhibition of the Impressionists" -- and a movement was baptized. 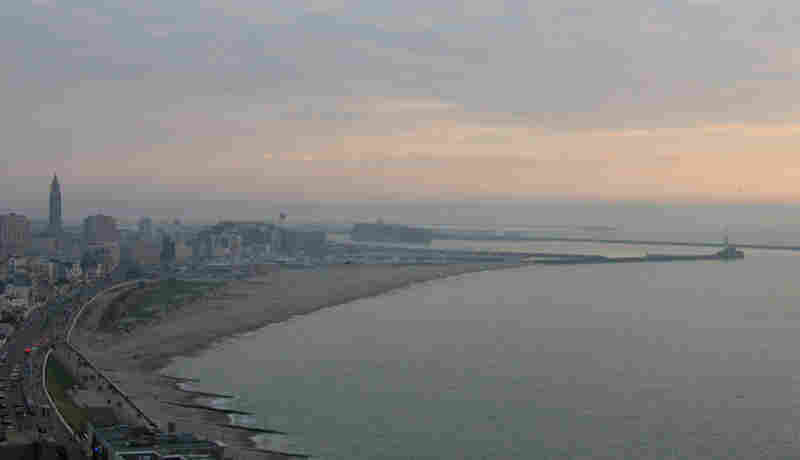 Visitors to the Andre Malraux Museum on the Le Havre waterfront can see what the great impressionists saw -- the English Channel, full of glints and glimmers as light catches its currents. Museum guide Emmanuelle Rian says the impressionists' fast strokes, their scenes of ordinary life, and the glimpses they left of unpainted canvas were brand new and brave -- "a real revolution in painting." She says impressionism advanced more in two decades than many artistic movements did in two centuries. The impressionists broke all the formal academic rules -- they used quick brush strokes, changed perspective, made their shadows out of color, not black. And it all started with a young painter, sitting by the water's edge in Le Havre. Rian, who works every day in the location where Monet painted his masterpieces, says she doesn't think she sees the water the way Monet did. She simply doesn't have his eyes, she says. Twenty years after Monet painted Impression, Sunrise, he created 30 paintings of a massive Gothic cathedral in another port city in Normandy, Rouen. He detailed extreme close-ups of one part of the cathedral's facade, using flattened perspective and encrustations of paint. Today, in the room where Monet worked, classes teach aspiring artists how to paint in the master's style. Monet spent six months painting the Rouen Cathedral, working to capture — sometimes on 10 canvases at a time — the way light played across the Gothic structure. Eleven of Monet's cathedral paintings are on view at the Rouen Fine Arts Museum. Guide Catherine Brandon explains that Monet worked in town on his cathedral series for parts of 1892 and 1893. "He came to Rouen twice," Brandon says. "Two sessions of three months -- in the same period because of the light -- February, March, April. He sat from 7 o'clock in the morning until maybe 6 or 7 in the evening, just painting the cathedral. Ten canvases at the same time, just to capture the light." Monet lined up his canvases in front of a window, moving from one canvas to the next as the shifting light changed the colors of the pale stone facade. "You can see on each different cathedral, the sky is not the same," says Yves Leclerc, who runs the Rouen tourist office -- just across the street from the cathedral, in the building where Monet worked. "There was no camera. No photo. Nothing. [All he had were his] eyes and his spirit." In Monet's time, the building across the street from the cathedral was a lingerie shop, and the painter rented space by the shop window. Leclerc says customers were not enthusiastic about the artist's presence. 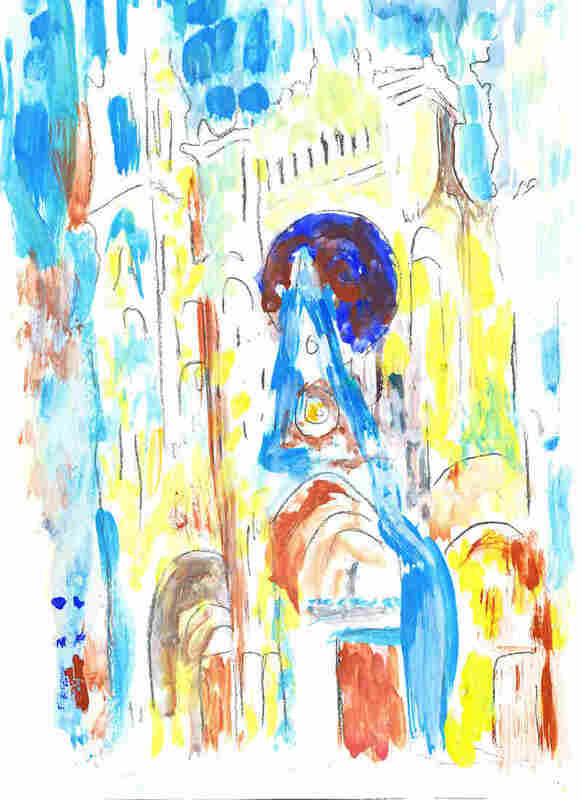 Paint Like The Master: NPR's Susan Stamberg tried her hand at painting the Rouen Cathedral in a class offered to visiting tourists. Want to give it a try? You can find an outline here. "Imagine a Norman guy," Leclerc says. A "tall, big guy -- very strong Norman -- and these small ladies come [in to try on] underwear." So a screen was placed between the painter and the ladies -- though Leclerc says rumor has it that a small hole was found in the screen after Monet finished his work. Never mind the distractions -- M. Monet was surely too busy studying the paths of light on the cathedral and converting them into crusts of color on his canvas. The effort to capture the light on the cathedral obsessed the 50-something artist. He was painting light, but his work weighed on him. Nothing satisfied him, and he began to have nightmares. 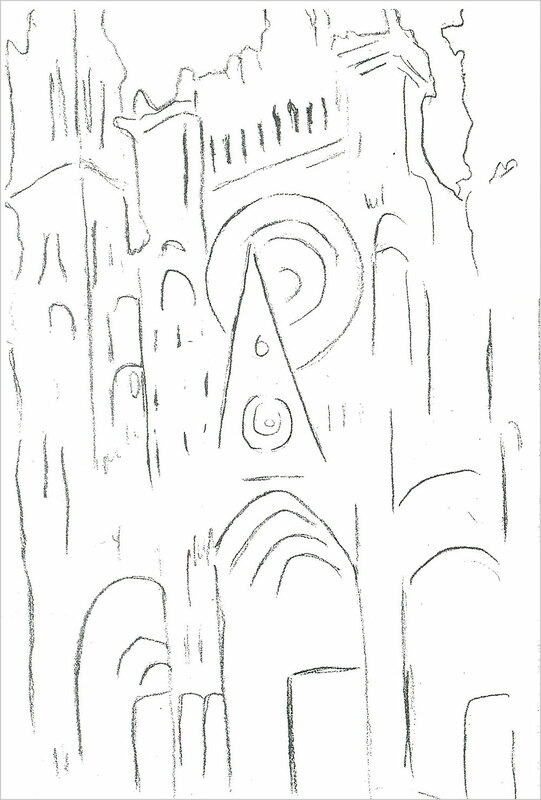 "He dreamt that the cathedral would fall down on him," Brandon says -- huge stones, crashing down in pinks, golds, blues. "In the end," he wrote to his wife, "I am trying to do the impossible." Monet didn't finish his series of cathedral paintings on the scene in Rouen. He took them home to Giverny, about 45 miles northeast of Paris, home to his family and to his garden. It was around this time that he began putting in a water garden. The master spent the last decades of his long life shifting the shimmers of that garden onto his canvases.